Richard A. Ciccarelli, D.M.D. received his Undergraduate Bachelor of Science Degree from the University of Pittsburgh and his Doctor of Dental Medicine Degree from the University of Pittsburgh School of Dental Medicine. He completed a Residency in Pediatric Dentistry at Allegheny General Hospital of Pittsburgh. Dr. Ciccarelli is a member of the American Dental Association, The Pennsylvania Dental Association of the Dental Society of Western Pennsylvania and is active in many local community organizations. He resides in Cheswick with his wife Davida. They have two daughters, Dana and Deanna, and four grandchildren, Aidan, Mia, Ainslee and Max. 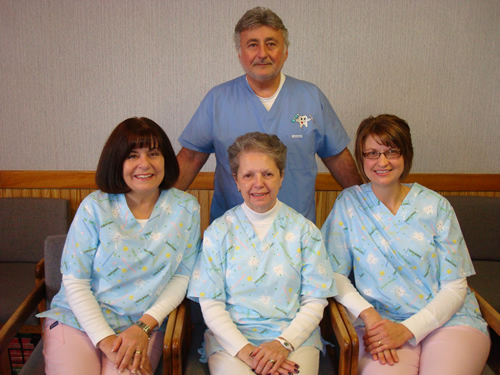 Marlene Tissue has worked as our Dental Receptionist since Dr. Ciccarelli began his practice in 1976. Marlene's primary responsibilities include scheduling, insurance processing and billing. Marlene resides in Cheswick with husband Richard. She has two daughters, Robin and Karen and granddaughter Lilly. Call Marlene if you wish to schedule an appointment or have a question about your insurance or billing. Kathleen Matus, RDH, has been our dental hygienist for the past 33 years. She will instruct your child on dental hygiene techniques while emphasizing good nutrition habits. She is a graduate of the University of Pittsburgh with a degree in Dental Hygiene. Kathie resides in Cheswick with her husband Dan and has two daughters, Danielle and Keri. Michelle Townsend is our newest member to our staff. She has been our dental assistant for the past five years. Michelle is a graduate of Career Training Academy with a certificate in Dental Assisting. She resides in Bell Township with her husband Todd and daughters Karlee and Nicole.